4.2.2.10 The governments have two format options to present net position. The statement of net position requires distinguishing between the governmental and business-type activities. 4.2.2.20 Governmental activities generally are financed through taxes, intergovernmental revenues, and other non-exchangeable revenues. Governmental activities are usually reported in the governmental fund types and internal service funds in the funds financial statements. Examples include police, election, fire prevention services, etc. 4.2.2.30 Business-type activities are financed in whole or in part by fees charged to the users of the services. They are reported in the enterprise funds in the funds financial statements. Example includes utility operations. If the government has immaterial business-type activities, it is not required to separate them on the face of financial statements. They may be reported in the governmental activities column. 4.2.2.40 Internal service funds are generally reported in the governmental activities column, but they may also be reported in the business-type columns if the predominant users of these funds are enterprise funds. Some interfund balances are to be eliminated. See Eliminations. 4.2.2.50 Assets should be presented either in order of their relative liquidity or in the classified format. Liquidity describes how readily an asset can be converted into cash. Liquidity may also depend on whether there are restrictions limiting the use of those resources. Restricted assets should be also analyzed in terms of their liquidity and placed accordingly in the financial statement. The statement’s lines are not specifically defined and the governments should use their own judgment regarding what level of detail they want to present in the financial reports (e.g., capital assets may be one-line item or have separate lines for land, buildings, infrastructure, etc.). The government should list separately any assets with significant balances. Assets that are not depreciated (inexhaustible or infrastructure using the modified approach). Inexhaustible capital assets are defined as one whose economic benefit or service potential is not used up or is used up so slowly that its estimated useful life is extraordinarily long (e.g., land, certain land improvements, certain infrastructure, construction in progress, etc.). If the government has a significant amount of nondepreciable capital assets, it should report them in the statement of net position separately. The depreciable capital assets should be reported net of accumulated depreciation. Accumulated depreciation equals total of all amounts of depreciation expenses in statements of activities (from the time when a capital asset was acquired). Accumulated depreciation may be netted against capital assets or reported as a separate line on the face of financial statements or in parentheses. Regardless of the presentation method, it has to be disclosed in the notes to the financial statements. Capital assets of the government that are not specifically related to activities in proprietary or fiduciary funds are considered general capital assets. They are associated with governmental activities and financed by the resources of governmental funds. 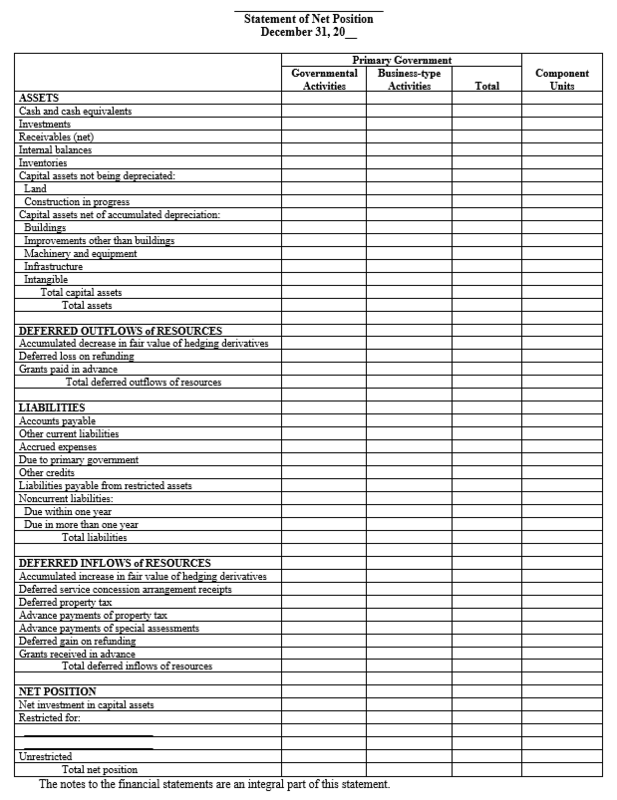 Capital assets of internal service funds should be generally reported as capital assets of the governmental activities unless the internal service fund is reported in the business-type activities column. 4.2.2.60 A deferred outflow of resources is a consumption of net assets by the government that is applicable to a future reporting period. Recognition of deferred outflows of resources should be limited to those instances identified by the GASB in authoritative pronouncements. See BARS Manual, Classification of Deferred Outflows/Inflows of Resources. The amount due in more than one year. 4.2.2.80 The face of the financial statements should contain a summary of liabilities information and the details about their changes should be provided in the notes. This requirement applies not only to bonded debt but also operating liabilities like compensated absences, claims and judgments. Their portions due within one year need to be reasonably estimated. Current liabilities. They equal liabilities reported in the governmental funds financial statements. They may also include some liabilities from the enterprise fund(s), if the activity accounted for in this fund is presented as a governmental type in the statement of net position. General long-term liabilities. This amount should equal the unmatured portion of liabilities not reported in governmental funds. The liabilities should include: general obligation debt, capital leases, special assessments, compensated absences, claims, judgments, landfill closure and postclosure care costs, certain pension related debts and postemployment benefits, etc. 4.2.2.100 There is no change in presentation of liabilities for business-type activities since both the enterprise funds and government-wide financial statements are prepared using full-accrual basis of accounting. 4.2.2.110 A deferred inflow of resources is an acquisition of net assets by the government that is applicable to a future reporting period. Recognition of deferred inflows of resources should be limited to those instances identified by the GASB in authoritative pronouncements. See BARS Manual, Classification of Deferred Outflows/Inflows of Resources. 4.2.2.120 For information about net position see Net Position.